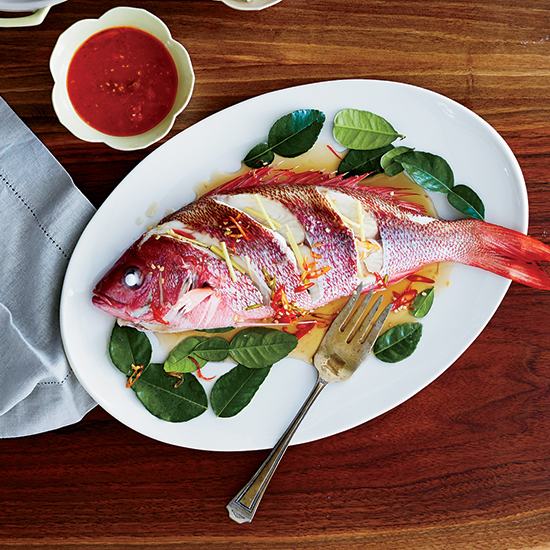 The duo behind Charleston's best pop-up shop hosts a fantastic dinner with shrimp toasts and gingery snapper. In the middle of Charleston, South Carolina’s stately downtown is a small, boxy stucco building. Formerly a hat shop, laundromat, ice cream parlor and church, it has found new life yet again, this time as an idea lab. The owners are Helen Rice and Josh Nissenboim of Fuzzco, a small creative agency connected with many of Charleston’s most talented chefs and artisans. Mike Lata tapped Fuzzco to design menus and a logo for his latest project, seafood joint The Ordinary—a project that sent Rice and Nissenboim off on a six-day eating tour of oyster bars in New York City, all in the name of research. For a new beef-jerky business, Fuzzco not only designed the logo, but Rice also commissioned her father to make recycled-wood display boxes by hand. Fuzzco’s building on Spring Street, now lined with honey-colored wood salvaged from Kentucky by a carpenter friend, sometimes hosts a pop-up shop, ironically called Pretend Store, with pieces from the firm’s clients. And occasionally, at night, Rice and Nissenboim hang lights from the rafters and throw parties with Fuzzco’s inner circle of creative collaborators. food restaurant called Xiao Bao Biscuit in a repurposed Charleston gas station about a year and a half ago. The menu features the spicy, sweet and funky flavors Walker and Li discovered all over Asia, re-created with South Carolina ingredients. Walker and Li entered Fuzzco’s creative sphere when they hired the agency to design Xiao Bao Biscuit’s menu, website and logo. Fuzzco came up with the hand-drawn image of a neatly tied pouch, depicted in vivid colors—an homage to a traditional form of Japanese gift-wrapping called furoshiki. Unlike Fuzzco’s work for The Ordinary, this project did not demand an ambitious research trip. It did, however, require consuming test batches of kimchi pancakes before Xiao Bao Biscuit opened, conveniently, just a few blocks from Pretend Store.